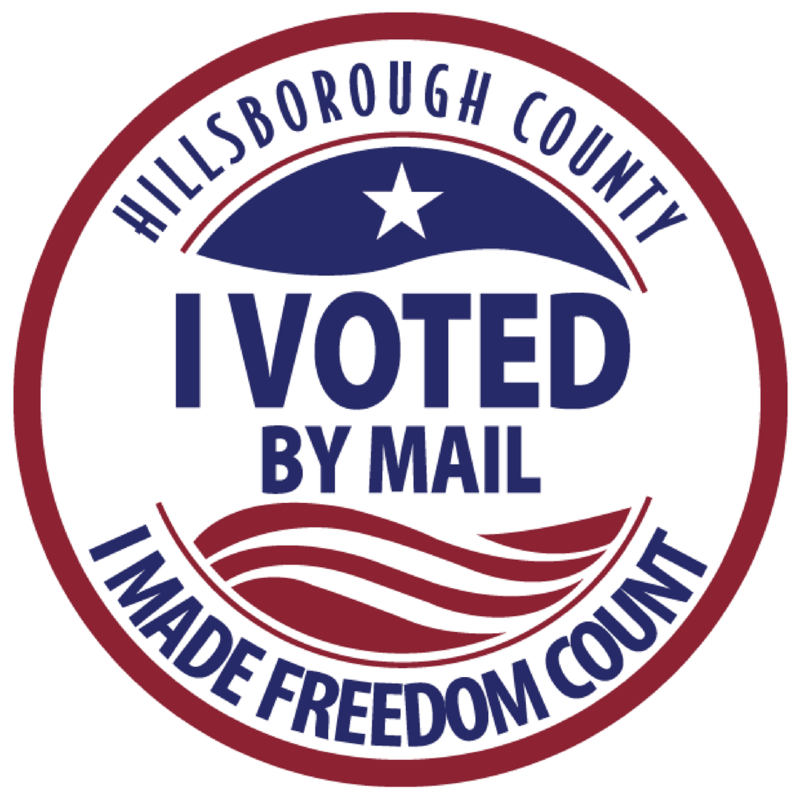 Have you already requested a Vote By Mail ballot? Click on the Track My Ballot button to see when the ballot was mailed out and when we received it back from you. If you haven't already requested Vote By Mail, keep reading. There's no easier way to vote! Vote By Mail is the most convenient way to vote. And we even include I Voted By Mail stickers in every envelope, so you can let your friends know you voted! You'll receive your ballot in the mail, and can take your time making your voting decisions. You must sign the return envelope and we must receive your Vote By Mail ballot no later than 7 p.m. on Election Day for your ballot to count. If you plan to mail your ballot back to us, you should allow at least a week for your ballot to reach our office. You can also drop your ballot off in person at any of our offices (during office hours) or Early Voting locations (during Early Voting hours). Any registered voter can vote by mail. Formerly known as absentee voting, Floridians no longer need an excuse to choose this option. Whether you plan to be in town or out of town on Election Day, we'll send your ballot wherever you need it to be. Just make sure to let us know if your mailing address changes. We keep the most recent mailing address on file for all of our correspondence with you. By law, we make special accommodations for military and overseas voters. You can find information about that here. You can request Vote By Mail for a specific election or for all elections up through the next two General Elections. After two General Elections, you'll need to make the request again. You are allowed to request a Vote By Mail ballot for yourself or for an immediate family member. Immediate family members include a spouse, parent, child, grandparent, sibling or legal guardian. A request for an immediate family member must include: voter's name, address and date of birth, and the requester's name, address, driver license number (if available), relationship to the voter, and signature (for written requests). The deadline to request that a Vote By Mail ballot be mailed to you is no later than 5 p.m. on the 6th day before the election. By mail. The postage is already paid, so just put your signed envelope in the mail. You should allow at least 5 days for your ballot to reach us by mail. Drop off during Early Voting. We have secure ballot boxes at every Early Voting site during Early Voting hours. No need to stand in line. Drop off at any of our four offices. Right after we mail out our first ballots, we set up secure ballot boxes at our offices. Come by when our offices are open and drop your ballot off. These offices are the only place you can drop a ballot off on Election Day. When we receive your ballot, we check your signature against the signature you submitted when you registered to vote. If your signature has changed over time, you'll need to use a voter registration application to update your signature. Signatures must be updated before Vote By Mail ballot canvassing begins. If you returned your Vote By Mail ballot but forgot to sign the envelope, or if there is a discrepancy with your signature, you need to complete and return a signature affidavit no later than 5 p.m. on the day before the election. Please follow the instructions on the form carefully, as failure to follow these instructions may cause your ballot not to count. Mistakes happen! If you are filling out your Vote By Mail ballot and you make a mistake, let us know. Whether voting by mail or at the polling place, voters can receive up to two replacements ballots before their ballot has been cast. Once the ballot has been mailed to our office, dropped in a ballot box, or inserted into a ballot scanning machine, your ballot has been cast and no replacements can be issued. Beginning five days before Election Day, you can designate someone to pick up your Vote By Mail ballot for you. Your designee will need a written request from you and a photo ID, and will be asked to complete this affidavit. On Election Day, you also have to complete this Election Day Absentee Ballot Delivery Affidavit to affirm that an emergency is keeping you from being able to vote in your assigned polling place.